Product Overview If you’re seeking a compact rack with versatility and functionality, we have a convenient enclosure just for you. The ExpressCage MB322SP-B is a mobile rack that converts a external 5.25” device bay to fit two 2.5” SATA/SAS HDD/SSD (7mm-9.5mm), and includes a 3.5” slot for either a hard drive or a 3.5” device. With the unique tool-less drive installation design, the ExpressTray Mini allows you to install your 2.5” SATA or SAS HDD/SSD just as quick and simple as a tray-less system while the optional bottom tray screw holes provide added stability. The MB322SP-B has a detachable dust cover which keeps the front panel enclosed to block out dust particles when the 3.5” slot is left unused or when there’s a 3.5” HDD installed. Soft blue LED indicator lights on each 2.5” drive bay notify you when drives are being used without being too distracting. For maximum durability we have implemented enhanced door latches and a solid metal housing. 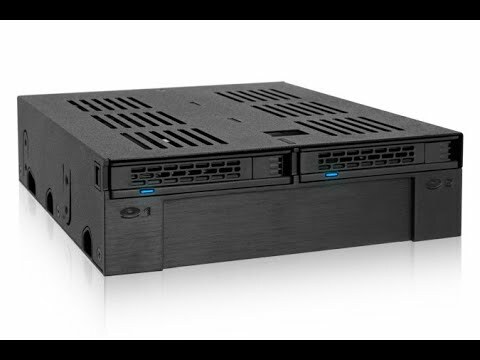 Not your typical 5.25” mobile rack, the ExpressCage MB322SP-B *takes two 2.5” SATA/SAS HDD/SSD of 7mm to 9.5mm height and converts them into two hot-swap drive bays. It also includes 3.5” slot for a 3.5” device or 3.5” hard drive for various build options. Note: 2.5” SAS HDD/SSD requires SAS host, and MB322SP-B supports SAS single channel only. With the extra slot, users can expand their storage by adding a 3.5” HDD or a ToughArmor MB992SK-B for two more 2.5” hot swap bays. The 3.5” slot is also compatible with an assortment of 3.5” form factor devices from USB 3.0 hubs to fan speed controllers. This versatility makes the MB322SP-B an essential tool for a wide range of power users and system builders looking to add variability to their computer build. In addition, for applications that require extra stability we have provided the optional bottom tray screw holes so you can secure your drives. The MB322SP-B’s 3.5” slot for 3.5” HDDs or 3.5” devices comes with a detachable dust cover that not only protects your devices from dust and debris but also blends in with your system. So if you decide to leave the 3.5” slot empty or you have a 3.5” HDD for additional storage, the dust cover provides a visually flowing look while preventing dust from entering the system. The ExpressCage also comes with a metal cover finish for robustness and numerous ventilated slots for enhanced cooling. Each bay has its own indicator light to notify you of any hard drive activity. Soft-blue LED makes it easier to sense when drives are in use without straining your eyes. Features • Compatible with any standard external 5.25” device bay. • Fits 2x 2.5” SATA/SAS HDD/SSD and 1x 3.5” HDD/Device. • Supports 2.5” SATA/SAS HDD/SSD of 7mm & 9.5mm height. • Supports SATA 6Gbps or SAS single channel (requires SAS host). • Active Power Technology (APT) - only powers up if there is drive installed in the drive bay. • Soft blue indicator LED provided for each 2.5” HDD/SSD bay. • Detachable dust cover for 3.5” slot to keep debris from entering your system. • Enhanced tray and metal housing with for maximum durability. • ExpressTray Mini system for tool-less, easy installation comparable to tray-less designs. • Numerous ventilated slots for enhanced cooling. • Compatible with our lineup of 3.5” mobile racks like the MB991SK-B and MB992SK-B. • Designed for power users and system builder applications, mainly space saving and hot swap usage and for 2.5” HDD or SSD.